Dutch composer and performer Ernst Reijseger is a major personality on contemporary music scene: over the last decades he has created works filled with poetry, beauty, pure elegance and delicacy. The genesis of Crystal Palace dates to the encounter with American painter Jerry Zeniuk, on the occasion of his exhibition at the state gallery of modern art in Augsburg (Germany), called Glaspalast. In this place, inspired by a world of pictures, Reijseger recorded this program, while Zeniuk painted under the influence of Reijseger’s music. 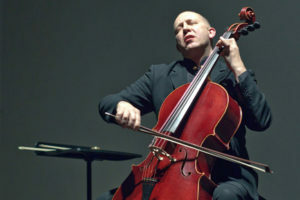 Ernst Reijseger began as a performing cellist and improviser in 1969. From that time on, he developed his own musical vocabulary. He writes for and improvises with musicians and ensembles of different musical disciplines and nationalities. Since 2004, Reijseger has written music for four films and a 3-D documentary by director Werner Herzog: The White Diamond, The Wild Blue Yonder, Rescue Dawn, My Son My Son What Have Ye Done, and Cave of Forgotten Dreams.